Dynamics of Advanced Sustainable Nanomaterials and Their Related Nanocomposites at the Bio-Nano Interface highlights the most recent research findings (conducted over the last 5-6 years) on the dynamics of nanomaterials, including their multifaceted, advanced applications as sustainable materials. In addition, special attributes of these materials are discussed from a mechanistic and application point-of-view, including their sustainability and interfacial interactions at the bio-nano interface and different applications. 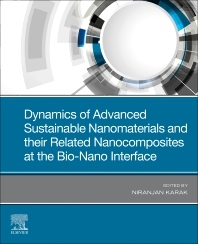 This book presents an important reference resource on advanced sustainable nanomaterials for chemical, nano-, and materials technologists who are looking to learn more about advanced nanocomposites with sustainable attributes. Finally, the book examines the emerging market for sustainable materials and their advanced applications, with a particular focus on the bio-nano interface and their future outlook.